Nowadays on the global market a great confusion is created over one of the finest products totally produced in Italy, the Traditional Balsamic Vinegar of Modena (PDO). It is possible to find different kinds of real balsamic Vinegars, from the cheapest to the most sophisticated ones. A distinction should be made in order to identify these kind of products and most importantly, to recognize the ones which are made of the highest quality. In these series of articles we will deal with different types of balsamic Vinegar, their history and how they can be employed in our kitchen. What is the original Traditional Vinegar of Modena? 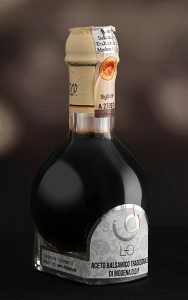 The Traditional Balsamic Vinegar of Modena (PDO) is one of the finest types of Vinegars existing on the market. The denomination PDO stands for “protected designation of origin”, which means that it is produced only in the area of Modena, thanks to the particular climate conditions of this area. In Modena it is widespread and almost all families have a set of barrels. Each modenese knows its unique flavor. The traditional (called also ABTM) is considered the Balsamic Vinegar for excellence and a source of pride for the whole territory. It’s a prestigious and noble vinegar. The traditional balsamic vinegar of Modena PDO is obtained from 100% cooked grape must, matured by slow acidification, derived from natural fermentation and progressive concentration by long aging in a series of barrels of different woods, without any addition of aromatic substances. The aging ta kes place in a series of barrels (sets), of different woods and decreasing volume, placed in attics of homes. Every year, especially with the technique of pouring, the smallest barrel battery provides a few liters of the product while the decrease due to concentration is offset by the addition of cooked must in bigger barrel. Only after an appropriate period of aging, the product reaches the balance of aromas and flavors that allows it to boast the Protected Designation of Origin Traditional Balsamic Vinegar of Modena PDO. As a consequence, it can be distinguished considering the age: 12 years (called Affinato) and 25 years (extra vecchio). The bottle of the product plays an important role: only the bottle of the consortium is recognized and without this particular bottle, the product cannot be called “Tradizionale”. Moreover, the price can range from 40/50 euros up to hundreds of euros; the prices varies because of organoleptic characteristics. IN THE KITCHEN: our balsamic Vinegar PDO can be perfectly combined with strawberries, as well as ice cream 🙂 Our website provides a great number of recipes, take a look to surprise your guests. Tags Alt="aceto balsamico" Alt="aged balsamic vinegar" Alt="aged vinegar" Alt="balsamic essig" Alt="traditional balsamic" Alt="vinegar"